Women's Hip Hugger Underwear is in stock. We will print it as soon as you order it. These knickers look hot, cover what needs to be concealed and are a breeze to wear. 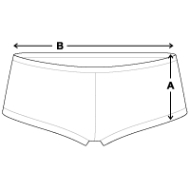 The elastic fabrics are designed with respect to accuracy of fit. These look very se y on my wife.